We offer HEATED TENTS at no additional cost if the temperature drops below 40 degrees in the fall and winter months. Pony rides , pony cart rides, horse, Clydesdale or evenLlama rides! A complete petting zoo, face painting, bubble machine, music and more. All at a very reasonable rate! We will travel to your location with our animals in Michigan or Northern Ohio. Visit us on our Facebook page for more pictures of our wonderful parties. Chamberlin is the best! over 5,000 fans can't be wrong! I just wanted to take a minute to talk about what a wonderful job Julie and Dennis did for my daughter’s 5 birthday party. They are absolutely fantastic. They are wonderful with kids, they love what they do and it comes across. They love their animals and this also is evident. I want you to know my party could have been a complete disaster. A huge storm rolled in exactly 15 minutes before my guests were to arrive. Julie and Dennis halted their set up and came in to see how they could help and what we wanted to do. Julie explained that we were the last party and she would be willing to work with us to try to put the party on to the very best of their ability. I just couldn’t believe the determination that they had to get my kid her party. I feel very strongly most people would have just said: “Sorry, can’t control the weather” and packed up and left, but not Julie and Dennis. They set up in the rain quickly and easily, as if they do this all the time. It seemed that they had it timed somehow down to the very last raindrop. They got set up in a matter of minutes. My stress melted away and I got to hold the animals with my 5-year-old and also my 2-year-old. Julie brought out the star of the show. A rainbow unicorn festooned with ribbons in her (his) hair and covered head to toe in magical glitter. Her little face lit up in sheer joy. Dennis helped gather the kids inside the yard and we rode the princess into her party atop the mythical beast. The kids hopped up and down in excitement as she took her ride around the yard and couldn’t wait for their turn. In just under a half an hour, our party went from wild kids running through the house while the storm raged to a magical, amazing event that no one will ever forget. I cannot express how much this meant to my little girl, to me and my family. Julie and Dennis are truly kind and wonderful people. When planning a party like this it is very important to be flexible, and have a back-up plan. If your back up plan doesn’t seem to work, just try to go with the flow, and you will be in good hands with Julie and Dennis. They will think of good ideas and suggestions. Listen to them. Let them do their job, which they do very well and everything will turn out just fine. Try to enjoy the animals, yourself. The animals are obviously beyond well-cared for (pampered even) and used to being around kids, the animals loved the attention and gave us a show by showing off and being so friendly with the kids. They all were just beautiful and so good natured. All in all, this event was just so awesome. Practically every parent there said this was by far the best birthday party they had ever been to. Coupled with jokes on how all of their kids were going to want unicorns now. Most importantly I think I had the best time myself. I just let go and didn’t worry about the ‘order’ of things which is not my typical nature. Julie and Dennis did more than take care of the party, they really took care of me. As a busy working mom that is a luxury I am not accustomed to. It was truly appreciated. Julie, Dennis you are amazing. We hope you enjoy a long and prosperous future of spreading joy to kids and families. We wish you the best and truly cannot say ‘thank you’ enough. Just know we are your biggest fans and loudest cheer leaders. We celebrated our twin girls' birthdays last weekend here at our house and I cannot say enough about how this company conducts business. From my very first phone call to the moment they packed up to head out, it was a pure pleasure dealing with them. Sally was great over the phone and Sara D was our event host along with her crew. The animals were such a hit. I had just a s much fun as the kids and we didn't want them to go! Thank you so much Kimberly for taking the time to leave your great review! Sara had a wonderful time with your girls. We can't wait to come back and make another birthday memorable. Chamberlin Animal Rides came to our house for my son's 1st birthday & daughter's 4th birthday. We had about 12 small kids, and 10 older kids. They brought a miniature pony, pony, and horse so that everyone at the party could participate!! (Yes - even the adults!! By the way, the kids really enjoyed watching their parents getting involved and having fun!!) The petting farm was such a hit! Even my 1 year old was giggling as he was petting the bunnies! !People continue to tell me that it was the best party they've been to, and their kids had so much fun . . . and isn't that what it's all about? There was so much for the kids to do - they never got bored!! Face painting & balloon animals were a hit - as was the roller coaster they brought.I can definitely tell you that it was worth the money! It was a party that everyone will remember for years to come!!! 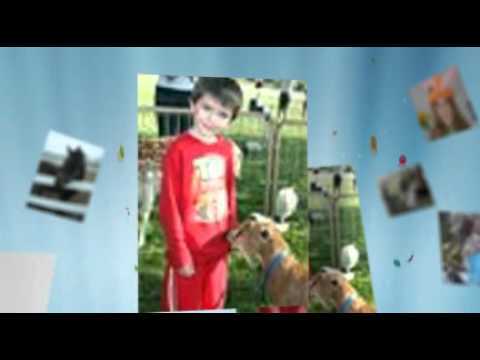 !great with kids and perfect animals "
I just had to write and tell you what a wonderful birthday party we had yesterday for our son's 5th Birthday thanks to Chamberlin Pony Rides! Carol and her crew were absolutely wonderful!! Everyone enjoyed themselves kids and adults alike, we even had some adult riders on the horse. Several people from the neighborhood stopped by to pet the animals, we caused quite a stir on our little city street! So much fun! Daughters 3rd birthday was great! Great company and very clean animals! I hired this company for my 5 year old little girls birthday party. We had a unicorn party and they actually brought a "unicorn". I had heard from my neighbors that they were the best company in Michigan and was I ever impressed! They were very professional and the animals were spotless. I will certainly be asking them to come back for my daughters 6th party. Expect the most professional pony ride and petting zoo company in Michigan. Accept nothing but the best for your special day. We offer many unique packages to choose from to make your event the most memorable experience. From a small 1 pony birthday party to an event as large as the Shrine Circus (Chamberlin is the official petting zoo company for the Detroit Shrine Circus). New for 2013 (and unique to Chamberlin) "Princess carriage rides" You may also add a real "Princess" character to your party for the ultimate birthday party experience. We are licensed and fully insured for your protection. Our events are staffed with professional adult event managers and experienced team members. All of our event managers come from a professional background. When you hire Chamberlin you should expect more than "just some guy with a pony". Our event managers come for all walks of life including: Bank President, Safety Director, Veterinarian. We are happy to provide you with many satisfied customer references. 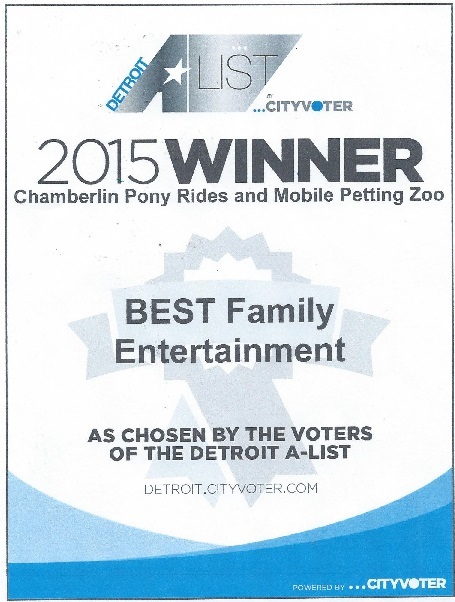 The most important and unique benefit you will have if you hire Chamberlin is we are the only pony ride/petting zoo company in Michigan who has a NO CANCELLATION POLICY. Please see (link hidden) FAQS page for additional information. Settle for nothing less than the BEST for your child's special day! We offer, Pony Rides, Petting Zoo, Pony Cart Rides, Horses, Complete Petting Farm, and all of the "extras" that Chamberlin is famous for... When you want your child's birthday party to be the most memorable event of his or her life, settle for nothing less than Chamberlin Pony Rides! If you are planning a Birthday Party, Family Reunion, Church function, Day Care Party this is the party for you! Most importantly you may actually go INSIDE the enclosure and cuddle and feed our animals. Some companies only let your view them from outside the enclosure. Pony Rides, or if your child weighs more than 70 pounds (a pones limit) we will bring a Full Size Horse at no additional charge. And sometimes adults like to "ride a pony" too! Our unique pony (or cow or llama) drawn Cart Rides This is perfect for small children who don't want to ride a pony as they can ride the cart with mom and dad. We will keep 2 rides running at a time and the petting zoo will be attended and open for children to pet, hold, learn about and even feed the animals. We also have bubbles, fun lively music and if you request we even have party games for the perfect party atmosphere! "Great party for up to 10 children"
As your children await their turn to ride the pony, they may love and cuddle our animals. 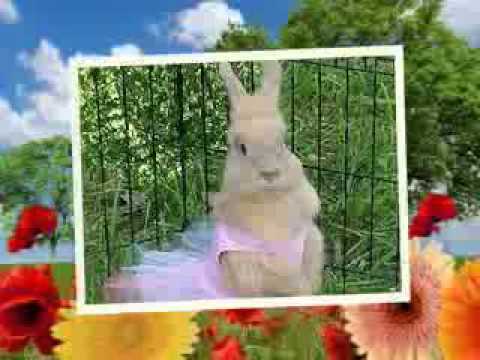 We bring small animals (ducks, rabbits, chickens) for free. This is a perfect party for your little cowboy or girl. We will come to your party dressed in cowboy hat and boots. We can even show your little cow kids how to rope a steer! We will bring two western theme horses or ponies (your choice). A horse is a great option for children weighing more than 80 pounds, or for small children who may get up on the horse with mom or dad.